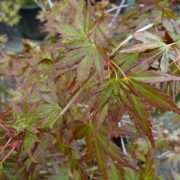 Acer palmatum ‘Burgundy Lace’ is a deciduous Japanese maple. 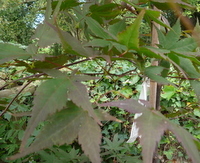 It has red\purple foliage in the spring and summer, which turns scarlet in the autumn. 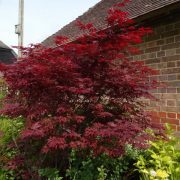 Acer palmatum ‘Burgundy Lace’ is a medium sized tree with an eventual height of 4m. 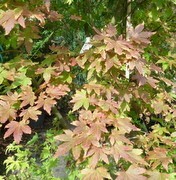 It prefers a partial shade position as full sun can scorch the leaves. 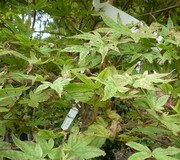 Acer palmatum ‘Chishio’ is a dwarf Japanese maple with variegated foliage. 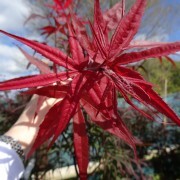 The small five-lobed leaves are crimson in the spring. 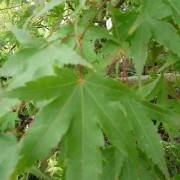 They turn emerald green in the summer. 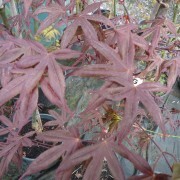 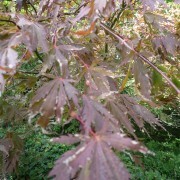 Acer palmatum ‘Chishio’ leaves turn orange\red in the autumn. 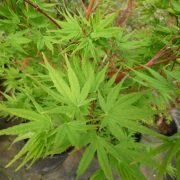 Acer palmatum ‘Chishio’ has an eventual height of 1.5m.